York, 31st March 2004, 56078 and 56115. Fifteen years ago today, Pathfinder Tours’ The Twilight Grids ran on 31st March 2004, the final day of class 56 operation. We know that some companies have used class 56s in recent years (I signalled one at work a couple of weeks ago!) but it’s just not the same, is it? 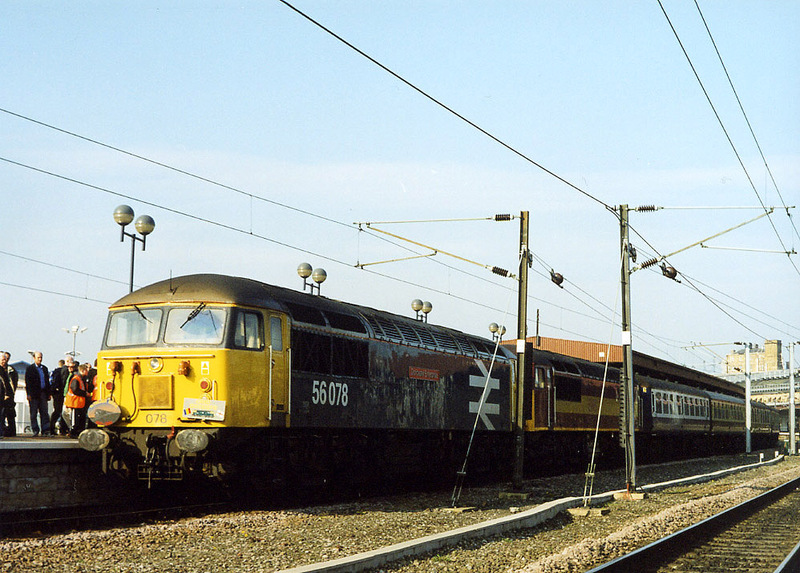 56083, Barnetby – just how we like to remember them. Despite the various newer versions on the class 47, I still really like the Lima model. The work Gareth Bayer did with them was an inspiration, and continues to be so. Of course I have used the Heljan model too (see Model Railway Journal no. 258 and here) and the Danish model runs beautifully, but it does have its problems as we well know – but what if we combined the two? And maybe refined it all with Penbits bogies and lots of Shawplan parts? Well, 47206 is the result of this collection of parts. Recently I’ve seen people online saying there’s no point in rebuilding older examples of ready to run models – well I think these people are wrong. With the right starting point, by carefully choosing one which is good and dimensionally accurate, you can achieve something which is better than the newer RTR items. It needs practice of course, but no one is born with a soldering iron in their hand, are they? It might be a big claim that we can make older models into models which surpass the newer crop of models, but what I can confidently say is that we can make them to a higher spec – and the beauty of this approach is you can make them to the exact specification to suit your own needs. Want fully sprung running gear in P4? No problem. Want to build the underframe to fit your preferred speakers for sound? Easy. There’s a lot to be said for making your own things. Even if suggesting others do so brings an odd form of aggression… This project is all about making the best of all we have available to us and, hopefully, really capturing the feel of the real thing. This particular model combines the beautiful tooling of the Lima body with a smooth and heavy chassis – the ideal combination I think. This model is 47206 as it was in 1992, before it gained its The Morris Dancer name. This is nondescript RfD loco, nothing special, nothing out of the ordinary. Exactly the sort of thing which we remember from watching trains back in the nineties. The front of the loco, freshly painted and the glazing fitted. The Heljan chassis runs very well, even if it is a bit heavy of current. In its unaltered form, the A1A-A1A wheel arrangement suits EM and P4 standards very well with that little bit of flexibility where some all wheel drive diesel models can struggle, even in 00 from what I’ve read. So you could easily retain its mechanical arrangement as is but there’s one huge problem. It’s too wide to fit the Lima body! This is where our friend Mick Nicholson came in. Mick is well known as both a historian and railway modeller, as well as another signalman, though no retired. I guarantee that you will have seen a layout at a show featuring his signals. The Gresley Beat immediately comes to mind. He has machine tools too! He kindly agreed to modify the chassis block for me – this entailed taking off 0,5mm/20 thou off each side. The chassis which Mick very milled down for me – notice the holes he has drilled in the casting to allow it to easily be mounted on the table of the milling machine. I finished off the chassis by filing the ends to fit the cabs/ends of the body – you could probably achieve the whole thing by using files, but milling it is undoubtedly quicker and neater. Mick made a superb job of it too – the body pitted beautifully as a result. And then the fun really began! Unlike the first Lima rebuild, 47294 the body required the buffer beams and associated valances to be removed as the chassis would retain these – all the time it needed checking against the chassis to ensure a good fit which looked ‘right’ at the same time. Very little work beyond removing the centre lugs inside the body was required to make the body fit the chassis, the outer lugs, below the body side windows actually engage in gaps in the Heljan chassis! The body being test fitted to the chassis – you can see the new parts around the cabs quite clearly. The body is actually a toy fair purchase – one of a pair I bought on a whim. Though once work started, it was actually a little rough beneath the ridiculously thick BR blue paintwork so the surfaces required more prep work before painting than I would have liked but the body was one of a pair bought for three pounds. Three quid! Although I’ve covered the work on Lima bodies before, I think it’s worth explaining it again. The Lima cab window frames are terribly heavy and spoilt things so they need to be removed. Completely. The cab side windows are too tall, but this is easily sorted – the corners require squaring off a two strips of Plastikard reduce the height of the opening. 20 thou at the top and 10 thou at the bottom. The new cab details can clearly be seen – the window frames, handrails, light surrounds and new headlight. The nose requires ‘flattening’ slightly, a Jim Smith-Wright suggestion – this helps improve the face of the loco significantly. It needs only doing slightly – use photos as a guide to gauge how much you need to do. The Lima model does have another issue in this area. The horn cowling leans back, rather than leaning forward. Cut as close as you dare behind the moulded louvres with a piercing saw. The isolated piece is then angled forward, gently, a little at a time and pieces of Plastikard wedged in behind it. Once in about the right position, the packing pieces need to be solvent welded in place – after they’ve set, they can be cut back and everything sanded smooth with a bit of filler to tidy it all up. It makes a huge difference. Shawplan’s window surrounds are etched in very thin stainless steel so need to be handled very carefully but they do make a huge impact to the overall look – thin superglue holds them in place without risking clogging the detail. The most critical thing is to make sure the windscreen surrounds are added symmetrically, otherwise the model will forever look like it’s winking at you! Take care to make sure the various windows sit at the right angles and in the right plane, it all helps capture that elusive character. I’m actually building a 7mm scle/O gauge class 47 from a PRMRP kit for the Railway Museum at the moment and when you’re presented with flat etchings for the various parts, this is when you realise how complex diesels are in terms of the various angle, complex and compound curves which help define their look. Handrails were added next, in the same way as the previous class 47s – even on newer RTR models, replacement handrails can make quite a difference, but here, replacing the moulded items is a must. I really like using 0.3 mm nickel silver wire from Eileen’s Emporium. The headlights came from Replica, these are absolutely superb mouldings. I was dissatisfied with the plain lights on my original Lima conversion at the number one end so I reamed the lights out to take a suitable sized tube of Evergreen tube which itself was reamed out to leave a thin wall of it to represent the rubber surrounds that hold the glass lenses in place – at the number two end the marker light surrounds came from a Shawplan etch. It’s little details like this which really do help us capture the feel of the real thing, all the little variations and quirks that real locos have. It would have been quite easy to keep the chassis pretty much as it came or use the simple upgrades I described in MRJ 258, however this wasn’t going to be one of these projects. Oh no! I like to complicate things! The underframe jig – this made things much quicker and easier. Instead of adapting the existing underframe mouldings I decided to scratch build my own underframe. Why? 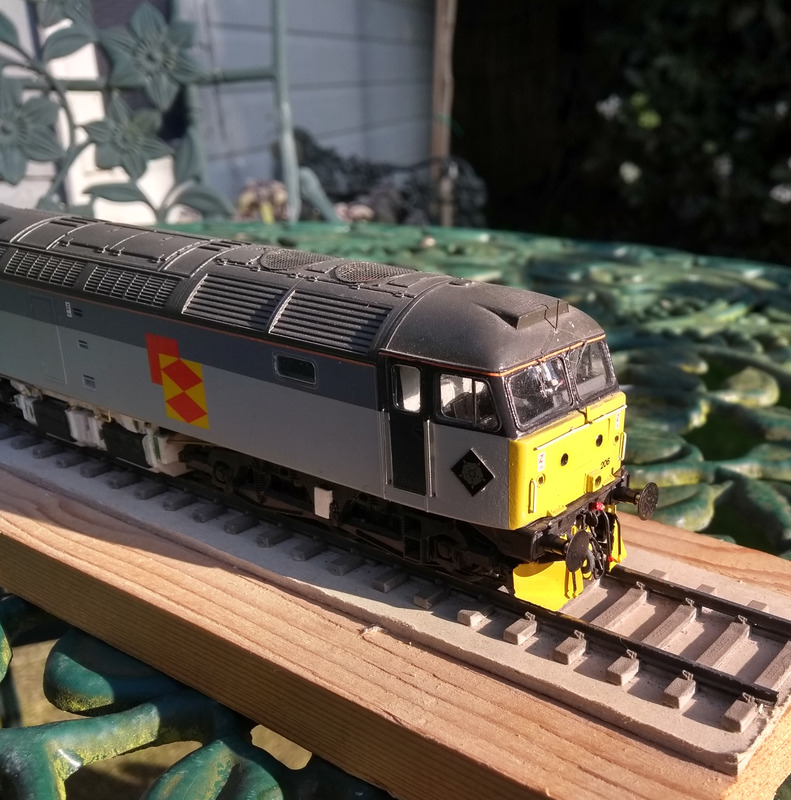 I’m not sure now but it seemed to be the best way to proceed and having heavily modified the Lima underframes previously, this isn’t such a leap – Gareth’s method can be adapted for this sort of project. So instead using parts of a moulded underframe this requires the framing to be built around its own false floor. It also needed the water tanks to be built from scratch. The basic underframe assembly – these are the water tanks awaiting the Lima battery boxes. The jig was used to make the various parts required for the tanks – Gareth’s original from UpDate gives a good overview of what’s needed. The basic dimensions can be checked from drawings but photos and educated guesses helped get things to the right shape and angles. It’s not high fidelity stuff! But it works, well I hope it does! Test fitting one of the battery boxes. I used Lima battery boxes as they’re very good, better than anything I could make in any reasonable amount of time anyway. It’s really just an exercise in simple scratchbuilding, an extension of Gareth’s original method. The pictures speak for themselves really – you can see how the whole thing goes together. Though, to be honest, I’m not overly satisfied with it. Seeing what Jon Hughes has done with Bachmann mouldings got me thinking. Given how helpful Bachmann’s spares department is, it shouldn’t be difficult to get spare mouldings for the full tank versions. Given how good Jon’s looks, though he is a very talented modeller, then this may be a better way to go for future models? That’s for the next one, but click here and be blown away by Jon’s model! He’s ridiculously talented! Once in primer the underframe doesn’t look too bad – it was airbrushed rather than from an aerosol to avoid clogging any of the smaller parts – unfortunately it was only after it had been painted and then weathered that I realised I’d forgotten the gauges on the side of the tanks. Perhaps a reflection of how I wasn’t truly convinced by my chosen method? Too late for 47206 though. The completed underframe in primer. One area of the project I was very pleased with running gear. My liking of Penbits parts should be quite obvious from other projects. Ian Penberth’s kits are absolutely excellent, they go together beautifully. In the case of this loco, the new brake gear makes a huge difference – the Heljan bogie sideframes have rather poor and basic brake details. One way to deal with it is to remove much of it, its absence actually improves things. However the Penbits’ brake gear is absolutely superb. I did reinforce the brake gear at the outer ends to help it withstand handling and the occasional knock as well as my natural clumsiness! Apart from this I built it exactly as the instructions told me to do so. If only other kits were as user friendly as this! Penbits Sprung Bogies -the complete unit on the left and, to the right, the three main subassemblies. Inside of painting it I blackened the whole thing with Birchwood Casey Gun Blue, it gives a lovely, very dark grey finish which has a slightly warm feel to it which is a perfect base weathering. Plus it doesn’t clog any of our nice fine details! Bogie Pipework – a cruel close up! Speaking of details, the bogie pipework makes a nice addition, even though it’s a real faff at times – worth the effort I think. Little things like this make a real difference – even more so when all the little touches start coming together. But you can’t rush them. So a good hour or so bending 5amp fuse wire to shape and carefully attaching it to the sideframes – tiny bits of 5thou Evergreen styrene sheet represent the brackets very well. Thoughts of bolt detail sensibly went out of the window, though inside the loco this sense didn’t prevail! But the final parts to be added to the bogies were the foot steps. I had considered using the PH Design steps but I worried how well they’d stand up to handling, so the Heljan steps went back on. A little bit of work with files improves and sharpens up their appearance rather nicely. Where sense didn’t prevail was in the cabs. I decided to improve the depth of the cab interiors, the false floor is very obvious through the replacement windows. It used most of the Heljan cab interiors, desks, rear walls and seats. When I sent James the photo of them first sorted, he jokingly asked where the power and brake handles were. The next day he got a photo of them in place! It was a joke but the result is very pleasing. The Modelu figure’s hand lines up with the controls very nicely too and it can be seen easily on the finished model too. Cab Interior – not the loco controls! There’s nothing really unusual about the finishing of the loco – nothing I’ve not described before. I worked from photos of the loco as it was in the summer of 1992. Flickr is an excellent source! I just wanted to create something of the everyday, nothing special just a typical RfD machine, albeit with oddly spaced numbers! Given how I’ve seen so many people dismiss older models as not worth the effort – people often seem to focus on the new rather than the best starting point – I do hope that this project is so. It’s got a spec and refinements in excess of most RTR models and it’s tailored to my own preferences. But most importantly, does it capture the feel of the real thing? The completed loco – a very everyday, nondescript RfD loco. Nothing special, nothing out of the ordinary, but what would we give to see these running like this every day now?! Just about there – does it capture the look and character of a class 47? Nearly there with the hybrid class 47! This is made from all sorts of bits and pieces – a much modified Lima body which has had its nose reshaped and the horn grille remodelled along with a lot of Shawplan parts. A broadside view showing the scratch built underframe which also uses Lima battery boxes. The chassis is a Heljan one, which has been milled to allow the Lima body to fit, and it runs on Penbits sprung bogies – these also feature full brake gear too. A Modelu driver completed the cab interiors to which I fitted new power handles and control handles! More lamp irons have appeared! Just a quick post regarding Antex. I think most of you will know the name and be familiar with their bright yellow soldering irons. I’ve just bought one of the ‘Lite’ 100 watt irons – unfortunately a 40 watt iron arrived. An e-mail to Antex and the next day I received a reply apologising for the error. It also said the correct iron had now been dispatched and a pre-paid envelope would be included for me to return the first iron. Sorted so easily, many other companies could learn from this. Wordless Wednesday – Who Remembers Dyna-Drive? Most of the way there now – notice the cab door! The model of 08405 is coming along nicely now – usual thing though, the small details seem to be what is really taking the most time and effort. Inside the loco – the Monty’s Models driver can be seen. I like to try and add a sense of ‘life’ into my models – even something as simple as an open window can do this, but here I’ve gone a little further. Making full use of Hornby’s opening doors here. The driver is a seated of loco crew from Monty’s Models, actually intended as a member of steam loco crew. In the early nineties there were still plenty of former steam drivers around – our 1992 period was only twenty four years after the end of steam, men in their fifties could have easily been on for over thirty years so his attire is very suitable for this time for one of the older drivers – the addition of a small hi-vis vest completes it quite nicely. He sits in a weathered cab interior Hornby’s interior is absolutely superb – washes of dirt and painting the floor really bring it to life. Is weathering a cab interior too much? I don’t think so – I do think it approaching ll aspects of the model in the same way is the key to making a model convincing. Hornby’s cab doors but their over scale hinges (over scale for obvious reasons!) mean the doors don’t sit correctly when open so these need to be removed and the doors fixed in place at the desired angle. I had intended to have both fully open but once I’d fixed the driver in place with Araldite there wasn’t enough room for his door to be open! But, the door being ajar does look rather pleasing. A selection of buffer beam pipes for 08405 – you can see the replacement vacuum pipes. To begin finishing things off, buffer beam pipework is very pleasing – a model looks so much more complete after these are added. I really like Hornby’s air pipes, they’re nicely sized and flexible enough to survive handling. They do lack detail around the taps for the most part, but I’m prepared to over look this as I think this is better than them being over scale in this regard. The vacuum pipes supplied with the class 08 and 09s are not so good. They’re rather underfed but it’s admirable how the two part pipe tries to capture the prototype. The result, however, is very fragile and looks far too thin. So replaced these using 0,9mm wire with details added with fine fuse wire. Although lacking in the finer detail of the moulded items, once weathered the result will be much better looking and much stronger. The original lamp irons have gone walkabout – they seem easy to loose! Replacements made from 5 thou brass are much better. I use a scrawker to cut a strip about a millimetre wide from the sheet. I make the whole item double thickness, so ten thou overall – you could use thicker material but this approach makes for a very strong but delicate looking lamp iron. This latter point is because a double thickness soldered together won’t really flex at all. Give it sufficient anchorage and it’ll never be lost or broken. The lamp irons – the cab ones have been fitted and the two for the front of the loco will need to be drilled for pins to allow them to be fitted to the footplate. The width is the only critical measurement at first, the height and depths can be sorted once the lamp iron has been assembled – checking against photos or known measurements. Delicate filing and finishing will produce a really nice result. Lamp irons fitted and chemically blackened. I’ve also fitted some lovely wipers from Shawplan. As the lamp irons will be black I simply chemically blackened them rather than faff about painting them! The finish is also a nice dull, dark grey, perfect for the sort of run down appearance many shunters had during this time. All in place and ready for weathering. Hopefully, this one won’t be long before it’s finished – the nice thing is that despite how good the Hornby model is, there’s still plenty of scope to add detail and really make something that isn’t just another ready-to-run model. A selection of details of various class 08/09 shunters – all should come in useful if you’re modelling one of the type, or a number of them as we are! Some have been deliberately overexposed to allow you to see the details of the locomotives. Is Rail Express Modeller getting it wrong these days? 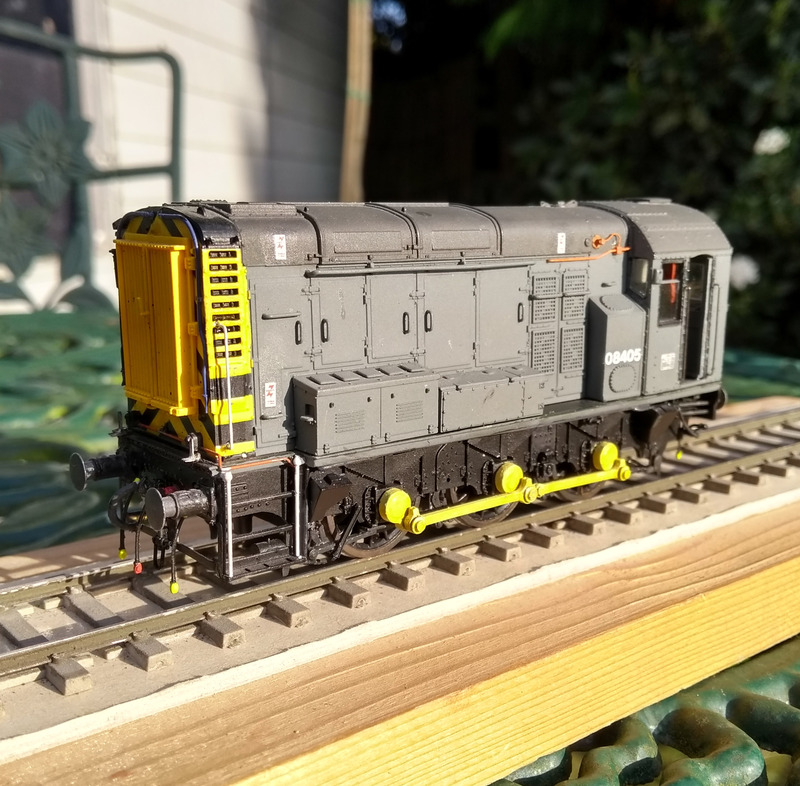 Last night we had a good chat, among other subjects about the recent changes at Rail Express Modeller (REM) – neither of us have been wowed by it to be honest. It has a back to basics approach which doesn’t suit the supplement because of its size. When you look back at the ModelRAIL supplements and REM in the Sutton and Bayer days they were much more specialist, leaving more general aspects to the larger monthlies. We also had the latest issue of Model Railway Journal to hand with a lovely, although short, article on modelling the Swindon Class 123 InterCity DMUs using Mark 1 coach sides from Comet Models as a basis. And the result is beautiful! 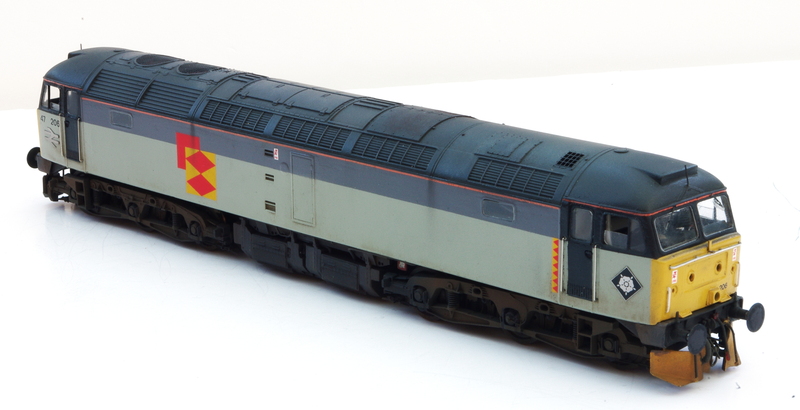 So the question is, why isn’t Rail Express Modeller, as it was once the leading light (along with its predecessor ModelRAIL) on modelling all things D&E, featuring work like this? 37255 at Quorn on the Great Central Railway. My next class 37 is slowly coming on now. The bogies are 50% complete, main work left is the brake gear but you need to be in the right sort of mood for that! Pentbit’s really go to town with their details here! I’ve begun to rebuild the fuel and water tanks as Bachmann’s model is rather lacking in detail here – on my model of 37514 I added an awful lot and, I think, it really makes a difference. It’s not always easy to get good, clear photos in this sort of area – underframes tend to be filthy and bathed in darkness. So if you’re attempting this yourself, hopefully these may help! This is 37255 at Quorn on the Great Central Railway in 2010.